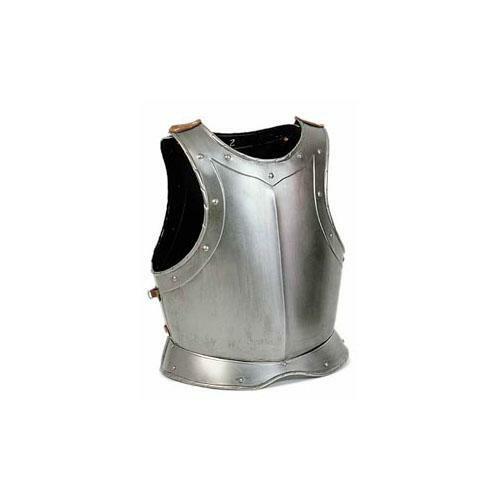 Medieval Cuirass consisting of chest and back to protect the part of the trunk, made of iron brushed with leather straps. Medieval Cuirass made to protect the chest and back part of the trunk. Italy, in use since the second half of the fifteenth century. Medieval armour (aged) of the fifteenth century, complete with pedestal, aged finish. Made by artisans in Italy, size and thickness on request. The Spanish Parade Tournament Helmet is made of steel and comes with colored ostrich plumes and a display stand made in steel. Helmet from Spanish Horse, heyday of the Iberian kingdom that is reflected in the subsequent manufacture of..
Spartan Muscle Cuirass, steel bronze finish, this premium piece of armour is modeled on historical examples. Add a..
Helmet Spanish Horse XVI Seco embellished with engravings, slits for eyes are drawn on the front of the cap, visor..
Greek Corinthian helmet of the fifth century BC, with crest and nasal paragnatidi fixed. Widespread in all the..